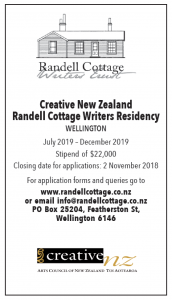 Applications are now open for next year’s New Zealand writer for the Randell Cottage Creative New Zealand residency. The successful writer will receive a total stipend of $20,000 (subject to funding from Creative NZ) and their stay at the cottage will be from April to September 2011. Click here for more information about the residency and how to apply. This entry was posted in Cottage and tagged application, residency. Bookmark the permalink.